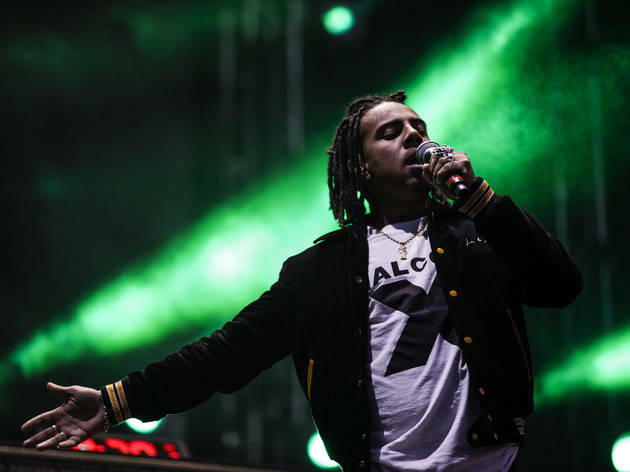 Like many of his contemporaries, major label deals and world tours have only served to deepen rapper Vic Mensa's connection to his hometown of Chicago. The city is a constant presence amid the verses of Mensa's debut album, The Autobiography, providing the backdrop to a near-death experience (he was electrocuted by a transformer while trying to sneak into Lollapalooza) and an eye-opening run-in with the police when he was just 12 years old. Mensa doesn't sugarcoat the violence and inequality that reared its head as he grew up in Hyde Park, but he also maintains his belief that positive change is possible. After performing at Lollapalooza and Goose Island's 312 Urban Block Party earlier this summer, Mensa returns to the stage in Chicago on December 5 to serve as the opening act for his mentor Jay-Z, who brings his 4:44 Tour to the United Center. We spoke with Mensa and discussed the origins of his latest record and his feelings about the state of the city he calls home. You scrapped the album you were working on before creating The Autobiography. Why did you feel pressured to change course? It was very important to me that my debut album was something that was very representative of me as a person and something that 10 or 20 years from now I could feel proud of every word that I said. I was not in the best place personally, so the music kind of reflected that. It was really dark in a guilty way and everything was drug-fueled. I needed to come from a place of clarity to be able to really tell the story that are the pillars of my experience and the right building blocks for a debut album. What attracted you to following in the steps of rappers like Kendrick Lamar and the Notorious B.I.G. by telling your life story through an album? The music took that direction on its own and I just picked up on it. I was making music and telling a lot of stories—it wasn't originally with the intention of making The Autobiography. Storytelling has always been one of my biggest strengths musically and also a common thread of some of my favorite artists. I was learning things about myself and remembering events that had been repressed or pushed to the bottom of my memory. I actually worked with a biographer while I was making the album, a woman named Kathy Iandoli. She came to Chicago for a couple days and we sat down at length and I told her my life story. She would ask questions that helped to lead me to uncover things that might not be at the forefront of my mind—it was a really interesting experience. Mental health and depression are addressed very frankly on The Autobiography. What are you hoping that those in similar situations will take away from your struggles? I'd like to influence people to be honest with themselves and confront things that they battle with and the issues that exist in their lives. You have to be real about it, examine it and take it seriously. Some of the best tracks on The Autobiography directly confront the violence and inequalities that have put Chicago in the national spotlight. Why do you feel that the city has become a scapegoat of sorts for problems that are prevalent throughout America? Obviously, those of us that are informed know that this constant scapegoating of Chicago is little but a distraction from the powers that be profiting from our pain. Chicago is a microcosm of urban black communities nationwide and what's happened in these communities is that African-Americans have generationally been confined into high-poverty neighborhoods by the use of red-lining and other techniques that restrict blacks from certain parts of the housing market. Imagine crabs in a barrel—the classic analogy for poor people in the ghetto—they're going to pull each other down trying to climb out. A baby that was born in the ‘90s whose father got hit with 20 years on a first-time drug offense, who grew up with a single mother in a neighborhood where all the fathers and young men were removed, who had no role models and blossomed into a criminal is exactly who Donald Trump is pointing the finger at right now. But, like I said, that's all just a distraction from the sources of the problem. As a person who understands the issues that Chicago is facing, what makes you hopeful about the city's future? I think that my generation and the group of artists that I've come up with are doing positive things for the city. We are committed to taking the well-being of our friends and family into our own hands. Salvation is not going to come through this system that failed us. My assessment of the mentality surrounding it is not "hope," it's "action." I'm going to act, I'm not going to hope. I'm going to try to enact change.